A mile or two south of Enniscrone in the far west of Sligo there is a group of round boulders hidden in the brush beside the road. These are the Mermaid Rocks. Many centuries ago, Thady Rua O'Dowd The O’Dowd (the head of an Irish clan was always referred to as “The”) was elected chieftain of his clann after his father died. His first task, before he could take up the new position, was to find a bride. This was a difficult task since there were so many to choose from, and he found that those he liked most were cold towards him, while he wasn't fond enough of those who would have him for a husband. For weeks and weeks he paced up and down the golden sands of Enniscrone beach until one morning, as he rounded the bend at Scurmore, he saw the most beautiful maiden he had ever seen in his life. She was sitting on a rock combing her hair and singing a haunting sea-song. The lady had no clothes on, but a cape lay along side her. The O’Dowd knew at once that she was a mermaid, and that the cape was the magic that allowed her to switch between human and mermaid status. Thady crept up close to this beautiful creature from the sea and snatching her fish-tail cloak which lay beside her. He made his feelings known to her and told her of his situation, and promised he'd love her forever and a day. She returned his love and and he took her home to his castle where they were soon married. Thady was the happiest man in the world that day and for many days and years to come. To ensure his future happiness, he hid the fish-tail carefully where his new bride, Eve, would never dream of finding it, because he feared he would lose her if she discovered it. When spring came and the daffodils grew around his fort at Castleconnor, Eve bore him the first of seven fine strong healthy children. Summer followed spring, and autumn beckoned winter over several years, and when the youngest was able to run and leap like a hare, Thady had to leave his fort for a period. Before he left, he checked the spot where the fish-tail was hidden, and placed it in an even better hiding-place. The youngest child spotted Thady at this task and told Eve where his father had "hidden a bag of gold before he went away". When Eve found the fish-tail, the longing to return to the sea came back to her, and, gathering her seven children together, they set off for the sea at Scurmore. They rested on top of the hill above Enniscrone and viewed the beautiful golden strand below, and Eve, knowing that she could not take all seven children with her into the sea, changed five of them into rocks. These granite boulders are to be seen to this day, close to the road at Scurmore, and are known as "The Children of the Mermaid". Eve and the two remaining children moved silently towards the seashore, and on the way one of those was turned into a rock. When she reached the water, she placed the youngest snugly inside her cloak and swam joyfully out to sea to meet the friends of her youth. She was never again seen. 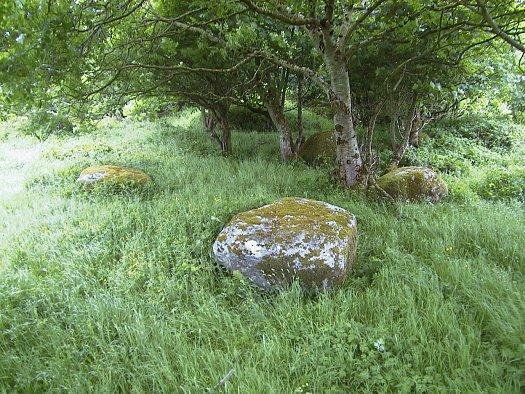 All that remains of Eve's family are the six boulders, five arranged in a circle, and one larger boulder sitting on the slope looking out over Bartragh Island in Killala Bay. It is said that the boulders weep each time an O'Dowd passes away.